Heiligabend erreichte uns eine traurige Nachricht. Glenn Switkes von der Organisation International Rivers war wenige Tage zuvor verstorben. Glenn war zunächst Journalist und Dokumentarfilmer, arbeitete eine zeitlang für RAN als Koordinator der Amazonas-Öl-Kampagne und war seit Mitte der 90er Jahre für International Rivers in Brasilien und angrenzenden Ländern überall da, wo Gefahr mit dem Ausbau der Flüsse drohte und die Anwohner Probleme hatten. Die wenige Male, die wir ihn zu erleben und Stunden mit ihm gemeinsam zu verbringen Gelegenheit hatten, waren so, als ob wir schon viele lange Wege gemeinsam gegangen waren. Wenn es soetwas wie eine Wald- und Weltrettungs-Community gibt, dann haben wir mit Glenn vor Weihnachten einen ganz, ganz Guten aus unser Familie verloren. Auf www.huffingtonpost.com haben wir einen Text von dem International Rivers-Mitarbeiter Peter Bosshard (leider auf Englisch nur verfügbar) gefunden, den wir hier zur weiteren Information dokumentieren. We mourn the loss of a dear friend and passionate fighter for the rivers. Glenn Switkes, the Amazon Director of International Rivers, died of lung cancer in Sao Paulo on December 21. Glenn was a force of nature. He loved the good things in his life - his family and friends, his guitar, an adventurous river trip, a good story and a few beers after work. He responded to the bureaucratic needs of a growing organization with mellow neglect and a twinkle in his eyes. But he stood up for the beauty of rivers and the rights of their people with a fighting spirit and unbreakable passion. Glenn was an effective thorn in the side of politicians and bureaucrats trying to push through more than 100 dams in the Amazon Basin with no respect for the environment and the Amazonian people. He gave generous support and inspiration to river activists throughout Latin America and the world. Glenn Switkes grew up in Brooklyn in the 1950s and 60s, and remained a passionate Yankees fan throughout his life. He got a journalism degree at UC Berkeley, and soon became an accomplished documentary filmmaker. 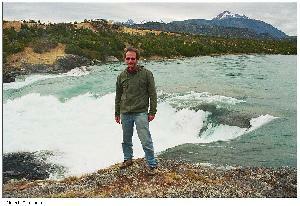 Glenn coordinated Rainforest Action Network's Western Amazon oil campaign, and joined International Rivers in 1994. Soon after, he opened our first satellite office in Brazil, where he was instrumental in defeating the destructive Hidrovia project. In recent years, Glenn helped coordinate a growing network of NGOs and social movements against the damming of the Amazon and its tributaries. Suffering from severe back pain and headaches, Glenn was admitted to a hospital in Sao Paulo in early December, and was soon after diagnosed with terminal lung cancer. A network of family members and friends accompanied him on his final journey with strong support and loving care. Our colleagues Patrick McCully and Monti Aguirre were honored to join him in the last few days. Glenn is survived by his strong and beautiful wife Selma, and his son Gabriel. Glenn was the soul of International Rivers. He leaves a gaping hole in the international movement of rivers activists. We will miss his cheerful songs when he visited our office, his irreverent humor in a difficult meeting, his boundless energy, his infectious and tumultuous personality. We will honor and celebrate his life with renewed fighting spirit for the rivers - and a good party. Like Selma and Gabriel, we deeply appreciate the love and support which we have received from Glenn's many friends around the world. We will inform about plans to honor Glenn's life soon.